So much happening on The Walking Dead this week in preparation for the season finale next week – don’t forget it’s 90 minutes instead of the usual hour. There’s a civil war brewing and it’s not just between Rick’s (Andrew Lincoln) group and the citizens of Alexandria, but also within the core group. It’s not as clear cut between right and wrong, unlike the other places where they have sought sanctuary. Alexandria and its people are not bad – except a few bad apples – but they are naïve and shortsighted. They are wrong to not listen to Rick about the way things really are. Then again their system has been working so far, so he may be wrong about wanting to stage a coup. I’m not sure where things will end up but I hope it won’t be as simple as them all being exiled. That would be boring. Girls rule – Rosita (Christian Serratos), Michonne (Danai Gurira), and Sasha (Sonequa Martin-Green) take out a ton of walkers. They haven’t gone soft yet. Daryl and Aaron stumble across something disturbing – While out scouting Daryl (Norman Reedus) and Aaron (Ross Marquand) find a man torn to pieces and a woman tied to a tree, apparently used as walker bait. Who did it? I’m thinking Nicholas (Michael Traynor) has a part in it, but why and is he (if it is him) alone? Deanna (Tovah Feldshuh) is afraid of something. Maybe she does know there is evil lurking right outside Alexandria’s walls and it has nothing to do with walkers. 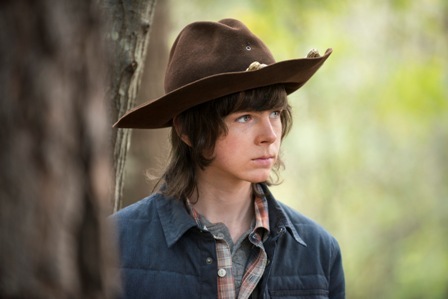 Carl gets some action – Not a lot, but I like seeing Carl (Chandler Riggs) being a teenager. I’m curious to know Enid’s (Katelyn Nacon) backstory. We know her mom’s also dead, so maybe she and Carol will find some common ground in the circumstances. Rick takes on Pete – We know Rick wanted any excuse to take on Pete (Corey Brill) and it came pretty easily when Jessie (Alexandra Breckenridge) told her husband to get out. This was a knockdown drag out that would have probably gone to the death if Rick had had his way. Michonne takes out Rick – That punch came from nowhere. Rick seems to be losing it a little. Not that I didn’t agree with what he was saying about the town needing to be stronger, but yelling that things were going to be his way from now on was not the way to do it. However, this puts Michonne and Rick on opposite sides of the war – at least for now. Where is everyone else? – I said this last week and I’m going to say it again – I don’t think they should completely leave characters out of the episode when everyone is in one place. While the others are out fighting walkers and abusive husbands Abraham (Michael Cudlitz) and Eugene (Josh McDermitt) didn’t set one foot outside? I wanted to see the aftermath of their heroic deeds last week. Eugene can vouch for Glenn’s side of the story, yet he didn’t factor in to any of the discussion about what really happened. And where is Father Gabriel (Seth Gilliam) after his “confession” to Deanna? I can’t wait for the season finale next week, though that means no more Walking Dead until October. However, there will be a new spinoff show launching this summer. Reportedly it goes back to the beginning of the zombie apocalypse and follows a different group of survivors who are in California. Should be interesting. The season finale of The Walking Dead airs Sunday, March 29 on AMC. 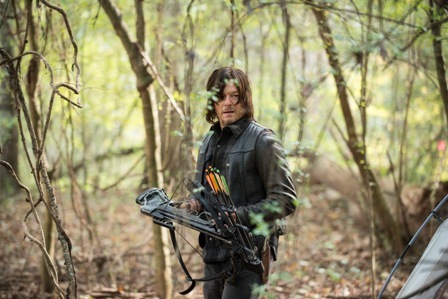 Pingback: Review: The Walking Dead Season 5 Finale "Conquer"